Magnetic dry erase boards with lines from OptiMA Inc. Our own line of Opti-Print magnetic dry erase boards with lines printed permanently onto the boards under our own exclusive dry erase writing surface. We offer a number of different very popular board sizes with horizontal lines spaced either 1" or 2" apart. Select from a 2' x 3', 32" x 45.5", 4' x 6' and a larger 4' x 8' size. The 32" x 45.5" is built this way so that it can still ship by UPS. A full-sized 3' x 4' would have to go by truck because of the size of the board and our packaging. 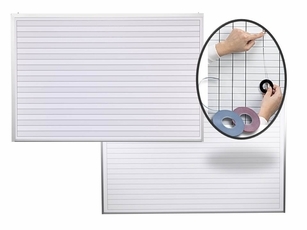 Use these lined boards with vinyl chart tape to create your own custom grid boards. The horizontal lines are permanent but you can make the columns as wide as you want using vinyl chart tape to draw your own vertical lines up and down the board. All of our horizontal lined boards are magnetic receptive so you can use all kinds of popular magnetic planning accessories including magnetic data card holders, colored write on, wipe off magnetic ribbon and more. You have the option of a 1" or a larger 2" tall row and they can be solid white or you can order a variegated board where every other row is slightly shaded to facilitate easier reading across the rows. All made in the U.S.A. and each one ships with the proper installation hardware with a lead-time of about 3-5 working days for the boards to leave our factory, then add transit time to your location from Massachusetts. Magnetic with horizontal lines at 1" or 2" apart. Select solid white or variegated lines. 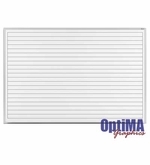 Magnetic receptive dry erase boards with horizontal lines at 1" or 2" apart. Select solid white or variegated lines.